As you likely know, if you search Google for “print company,” you will end up with more than a billion results. How do you choose which is best for you, your project, and your company? Search for “print companies near me,” on the other hand, and you end up with a shorter list of local screen printing companies to pick from that offer the same quality custom printing as the bigger print shops nationwide. In short, a local print shop can be your solution to your printing needs while allowing you to avoid a very long online guessing game. 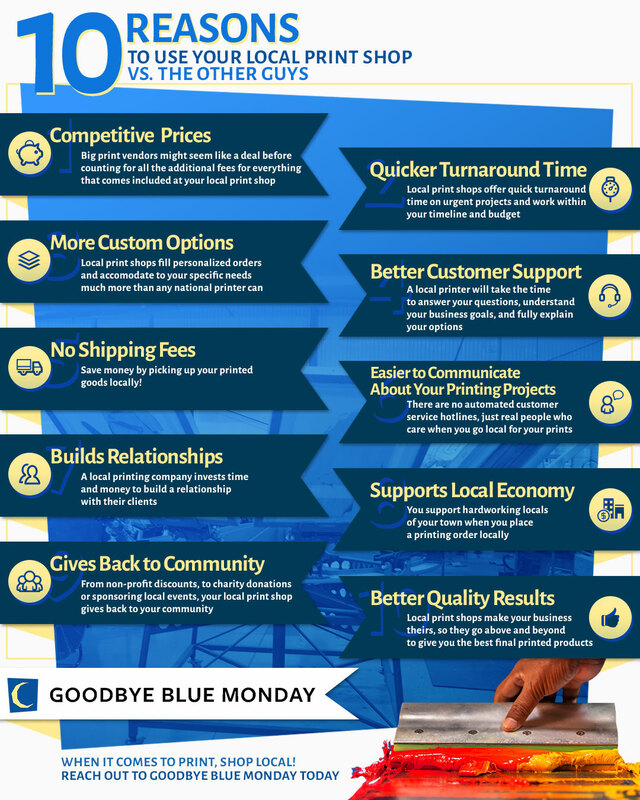 Here are the top 10 reasons why you should choose a local printing company like our Boulder print shop — Goodbye Blue Monday. 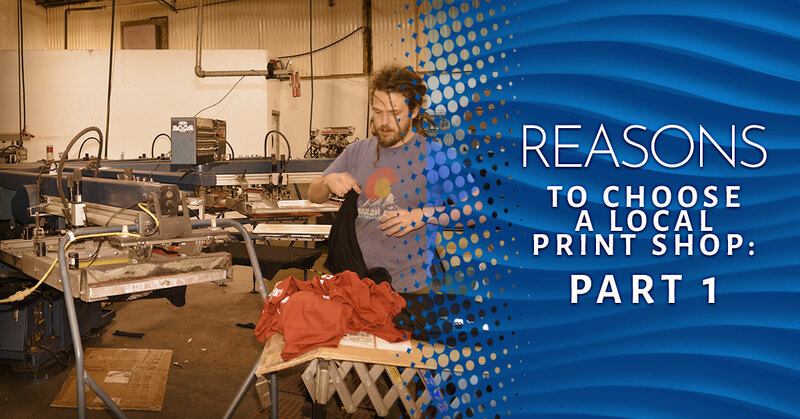 Many businesses consider turning to a national printer for their screen printing needs because of low pricing options, but you’ll be surprised to learn that your local print shop doesn’t differ much in overall cost. National printers offer low prices, but they are restricted to high minimums, tiered quantities, and do not include the cost of shipping. In addition, the cost of an independent graphic designer can get costly as most national print shops do not offer to include designing in their packages. Most sites you find today for custom screen printing orders offer either a DIY designing method or expect you to have your design files completely ready for print production. On the other hand, a local print shop has expertise that can save you time and avoid costly errors that oftentimes involve having to place an entirely new order. They’ve already invested in the equipment, supplies, designers, and print production staff to produce your project affordably and professionally. National online printing companies handle thousands of orders a day. This means when you place an order, it is placed in a queue and it will get done when it gets done, be shipped when it gets shipped, and arrive when it arrives, and there isn’t much you can do about it. Local printing companies live and breathe customer service, so they set job priorities to offer quick turnaround time on urgent projects and work within your timeline and budget for your specific project. When it comes to the needs of you and your business, your local print vendor’s quick and reliable services are worth their weight in gold. A local print shop can fill more personalized orders and accommodate more to your specific needs much more than any national printer can. They make it their business to help you with your business, whatever that entails. They’re willing to experiment and try new concepts out along with you, making it a growing experience for both parties. Try pitching your wildest printing ideas to a national vendor and see what response you get — if you get one at all. Attempting to talk over the phone about custom screen printing options or providing all of the information about your print project in a survey can be frustrating and confusing. A local printer will take the time to answer your questions, understand your business goals, and fully explain your options. Heck, we even have customers pop in our Boulder print shop on a daily basis to inquire about projects. Stay tuned for Part Two of our blog on reasons to choose a local print shop for your screen printing needs and other printing services. If you’re in Boulder, reach out to our print shop, Goodbye Blue Monday, or fill out the form below to get a custom quote today!